Graphic t-shirts have been around for years but say good-bye to those large logo’s and saying and update your look. Graphic tees have come a long way in the style game for men and women. The most important thing is finding a design or words that speak to your personality, whether you are into art, music, travel, fashion, sports or anything else. Graphic tees are often in black, white, or gray which means whatever you wear it with has to make a punch. Gentlemen add a colored button down shirt or a fitted vest over the shirt. Blazers in stripes or a small print look trendy with a bold graphic design underneath. Wear this with dark denim or a linen bland pant in navy or gray for summer. Trendy sunglasses complete your look. Ladies, from silk printed pants, to maxi skirts to slim fit denim or mini skirts…make the style your own. Artistic prints are trendy for ladies so pair that with a bold colored bottom or a neutral bottom with a colored print. Print on print is trendy to wear just make sure the prints accentuate each other and don’t compete. Go for a sleek look by staying in a color theme, such as black and white with the graphic tee. Intermix your favorite graphic design with a contrasting print to make a statement. This works with pants or a skirt and looks chic for summer with a gladiator sandal. When the weather cools rock this look with a shoe bootie or studded flat. Be sleek and trendy at an upscale event in a graphic tee. Pick a chic phrase and keep the design minimalistic. Pencil skirts in sequins or bold prints are fun and flirty. Bubble skirts work well too with sleek heels and a statement clutch. 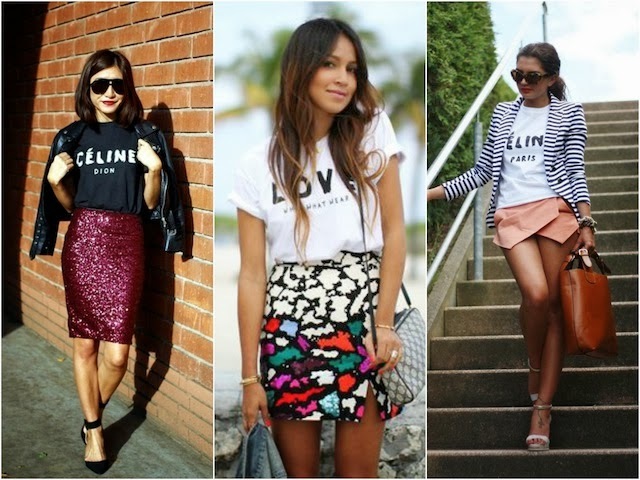 Work your trendy style into your look with a graphic tee. Belts accentuate or can detract from your middle depending on where placed. Add fun jewelry and colorful shoes or bags to enliven your look! Gentlemen, a fitted blazer looks trendy and current with a graphic tee. Wear this with a graphic design versus a phrase which can get cut off by the jacket lapels. Tuck in the shirt and a trendy belt finishes off your look, such as a rectangular solid buckle or look for one that fits your vibe, such as with crossbones, guitars, etc. 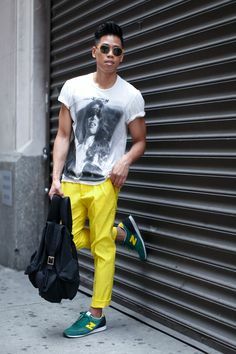 Add color to your look with spring/summer’s bold colored pants and bright kicks. Cuff your pants for a trendy, casual vibe. If you’d like help putting together your own style or look wearing graphic tees or any other trend, contact Divine Style DC. Here’s to being stylin’ in your graphic tees!